Danny Pugh hit a first-half winner to help Stoke City close in on a place in the Europa League group stages with a 1-0 win away at Switzerland’s FC Thun. Pugh’s left-footed strike in the 18th minute means Tony Pulis’s side need only a draw in the return leg at the Britannia Stadium next week to move through to the next stage. Thun’s goalkeeper, David Da Costa, was sent off in the final minute for violent conduct and in the fourth minute of injury time his replacement, the midfielder Stephan Andrist, tipped a Jonathan Walters strike round the post. Andrist was forced to go in goal because Thun had used all their substitutes. Pulis’s thoughts immediately switched to Sunday’s Premier League trip to Carrow Road, where his side will aim to build on their encouraging start to the season, the goalless draw with Chelsea. “Now the players are already recovering and resting because the next 24 hours are going to be vital prior to the Norwich game,” Pulis said. Thun, top of the Swiss league, had the first shot of the game in the 13th minute but Andrist’s attempt sailed over the bar. Robert Huth in the Stoke defence then booted clear a Muhamed Demiri cross. Pugh’s opener did not make it easy for the visitors. Thun piled on the pressure and, after clearances by Huth and the captain Ryan Shawcross, Thomas Sorensen tipped a Thomas Reinmann free-kick round a post. 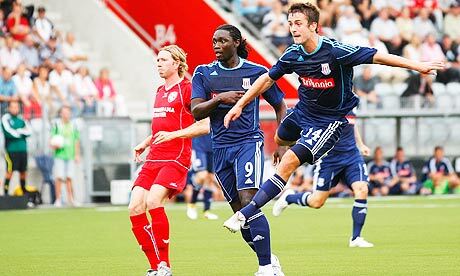 The home side continued to press for an equaliser after the break, Reinmann hitting a right-footed shot over the bar before Shawcross got in the way of an effort by Roland Bättig. But as the game wore on, Stoke’s fitness began to tell. Matthew Etherington shot over the bar, then brought a fine save out of Da Costa, who punched clear. Benjamin Lüthi drilled a right-footed free-kick into the Stoke wall in the 84th minute before Stipe Matic fired wide from 12 yards from a Reinmann cross as the final few minutes of the match proved to be the most eventful.